You don’t have to be cold! Cozy up with these great warming products and stop the shivers, inside and out. 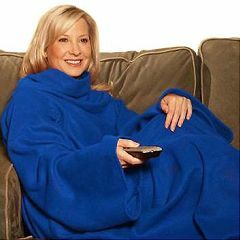 Snuggie Blanket with Sleeves– Honest to goodness, I ordered 7 of them! 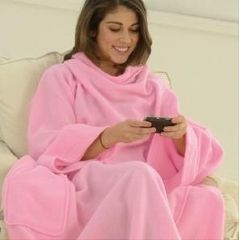 This soft, thick, luxurious fleece blanket with oversized loose-fitting sleeves will warm you from head to toe – and keep your hands free! Won’t slip and slide like a regular blanket. 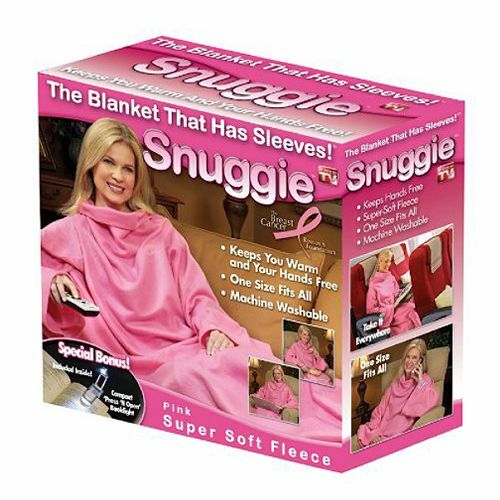 Choose from Blue or the Snuggie Pink Limited Breast Cancer Research Edition (while supplies last). Snuggie up! RoadPro 12-Volt Heated Travel Blanket – Never be cold on the road again. Plug this 100% polar fleece blanket into your lighter/power socket and feel the warmth surround you. 8-foot power cord. Zippered back for easy storage. 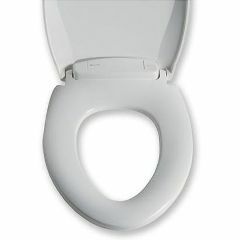 SKWOOSH Stadium Gel Seat– Cradle and warm your buns as you cheer on your favorite team with this super thin, but extremely effective TekPad gel-filled Stadium Seat. Weighs only 7 ozs and folds to the size of a piece of paper. Cold Condition Glove – These Ironclad cold weather gloves are designed to protect your hands from cold weather but allow for a high level of dexterity. Wicking material wicks away perspiration. Machine washable. Snappy Spa Portable Hot Tub – Nothing warms you more completely than a nice relaxing spa. Now you can have your own bubbling, whirling spa at a fraction of the cost of a traditional hot tub. Sets up quickly, requires no tools, and plugs into a regular household outlet. Seats 4 adults. Great gift for the family. Use it indoors or outdoors, on your patio or deck, in your condo or apartment, lakehouse, cabin or boat! Arthritis Gloves– Soft, breathable cotton lycra will make you want to wear these gloves day and night. Mild compression and warmth helps increase circulation and promote healing of arthritic, achy, painful, stiff hands. Great for working around the house or in the garden to keep your hands warm but your fingers free to feel, touch and grip. Grabber Peel-n-Stick Adhesive Body Warmers– Standard equipment for anyone who enjoys outdoor cold weather activities. Widely used for soothing cold, sore joints and muscles as a result of Arthritis, Raynaud’s, Lupus, Scleroderma, Fibromyalgia or just poor circulation. 40 portable heating pads per box, one time use, disposable. Warms for 12+ hours. For cold feet and cold hands, use Grabber’s Foot Warmers and Grabber’s Hand Warmers. Get a case and divide them up for stocking stuffers or gifts for your team members and friends. Gift buying is in full swing now that Thanksgiving has passed and it couldn’t be a better time to shop for the perfect gift at Allegro. Be sure to take advantage of our current promotions and exceptional deals when buying gifts for your loved ones . . . or for yourself. Happy Holidays! Give fun gifts like a pedal exerciser, folding shopping cart, body scrubber, body sox, large button t.v. 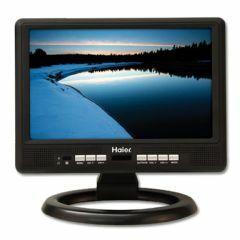 remote, digital picture frame, sonic alarm clock and more. How about choosing a unique gift like an electronic grocery list, alpaca fur slippers, a Beginner’s Loom, or a heated personal footrest? They’re all here. Or maybe something more practical like an overbed table or a portable lifting cushion? If you’re looking for luxury gifts, mobility gifts, travel gifts or high-end electronics, look in this category. How about a Personal Aquatic Treadmill, an inflatable Whirlpool spa, a wine cooler or a pink rollator? There are those, and everything in between. Get your gift gadgets here! From practical gifts to downright funky, we have big button t.v. remotes, retro telephones, Sonic Alert alarm clocks, an Internet viewer, a Digital DJ Station, digital picture frames, USB turntables, digital cordless handsets and more. We even have a Kodak ESP 3250 All-in-One Printer and the super affordable Kodak EasyShare Digital Camera! Shop for gifts for mommies, grandmas, wives, daughters, aunts and girlfriends here. Also, check out our professional curling irons, pilates equipment, yoga gear and relaxation products. You are sure to find something for each of the men in your life in Allegro’s Gifts for Him category. There are walkie talkies, a hunter’s cushion, Sno Wovel, Stadium Seat, a Wireless Weather Station, ScanGauge II Auto Computer – you know… guy things. What kid wouldn’t want a Fish in Space? Or a MegaView TV Microscope , LiftPack Backpack or (my favorite) a Little Red Scooter! See all these great gifts and more in Gifts for Kids. Where else will you find a Skull Alarm Clock along side a Pink Fur Rhinestone Phone? And if your teen is into snowboarding, surfing or skiing, you can’t go wrong with a Vew-Do Balance Board or a TRIKKE Snow Skii. They are all here in Gifts for Teens. Stocking Stuffer Alert! Get this Talking Pedometer for about 5 bucks! Stocking Stuffer Alert! De-Stress with these Massaging Eyeshades for under $6 bucks! Shop all Massagers. Get your gifts ordered TODAY! And have a ball shopping at AllegroMedical.com. Thank you for your business. We appreciate it. It’s a shame we can’t feel our blood pressure. It’s an even bigger shame when someone suffers a stroke, develops heart disease or flat out dies simply because they were unaware of their high blood pressure. If you rarely get your blood pressure tested, or test only at doctor visits, you may be missing the bigger picture. Unfortunately, high blood pressure, aka Hypertension, isn’t diagnosed in one reading. It can take time, especially if your elevated results are repeatedly labeled ‘white coat hypertension’ (a term used when the patient is anxious or nervous in clinical settings), possibly missing or delaying the truth. For me, it wasn’t until my doctor saw a pattern of high blood pressure – more than 140 over 80 (140/80) – over many visits that she recommended I monitor my BP at home. Only then did we discover that my high blood pressure was consistent and required medication. As you age, high blood pressure becomes more common. It is most common among adults over 35 and is prevalent in African Americans, middle-aged and elderly people, obese people, heavy drinkers and women on birth control pills. An easy way to monitor your blood pressure yourself is with a home monitoring device. They are inexpensive and very easy to use. Please understand that they are not intended to replace doctor’s visits. I highly recommend you take your blood pressure home monitoring device into your doctor’s office to compare your readings against their professional cuff. That way, they’ll trust your home readings when you report back. HealthSmart Premium Digital Wrist Blood Pressure Monitor – Chart and store the readings from 2 people in your household with this easy-t0-use digital wrist BP monitor. Features include WHO Indicator, Irregular Heartbeat Detection and more. Automatic Premium Digital Blood Pressure Arm Monitor – This fully-automatic blood pressure monitor has an arm cuff like the ones they use in a doctor’s office but the one-button operation makes it easy for home monitoring. Complete with WHO Indicator and Irregular Heartbeat Monitor, plus 60-reading memory bank, date/time stamp and large LCD display. Automatic Blood Pressure Monitor with AC Adapter – This arm cuff monitor has IntelliSense technology which helps ensure accurate and comfortable readings. It is completely automatic and works at the touch of a button. Operates on AC adaptor (included) or 4 AA batteries (not included. Premium Talking Digital Blood Pressure Wrist Monitor – This gem has so many features it will even speak your results out loud – in your choice of Spanish or English! It also has two memory banks, a Who Indicator, Irregular Heartbeat Detection and much more. Super easy to use. Advantage 6015 Digital Wrist Blood Pressure Monitor – This portable, economical and easy-t0-use wrist BP monitor offers a high degree of accuracy demonstrated through clinical studies. It is fully-automatic, runs on 2 AA batteries (included) and is latex-free. Comes in a compact storage case. To see all of our Blood Pressure Diagnostic Products go to our Shop By Condition: High Blood Pressure category. Feel more in control of your health. Order a Blood Pressure Monitor today! Travel, especially during the holidays, should be fun and exciting. Certainly no time to be stressed about safety, getting into and out of cars, on and off airplanes. And let’s face it, the more comfortable you are during your journey and at your destination, the better. But if you are elderly, disabled or traveling with small children, the magic of travel can be oh-so unmagical without proper prep. This year, let Allegro help you relieve a bit of your travel stress with our travel aids – designed for safety, convenience and comfort for everyone from babies to seniors. Transporation Comfort and Safety – Be safe and confident on the road with your Emergency First Aid Kit Auto Kit, Heated Blanket, Car Caddie and Handybar – to name a few. And how about a Car Bed for the baby? Or a Travel Pillow for you? Home Comfort and Safety – The comforts of home – in travel size! Take a folding bath bench, bed rail, portable grab bars, and bath mitt with you! Traveling with an infant? Don’t forget the Complete Nursery Care Kit. Travel Exercise and Fitness – Might as well just thank me now because you’ll be glad you had these go-anywhere Travel Weights, FitBALL Balance Disk and Travel Xertube Travel Kit on your holiday travels. Take some time to de-stress and work off that punkin’ pie with these great travel exercise products. We even have a handy travel yoga kit. No excuses! Recreation– Going on a campout, adventure trip or a long car ride? Don’t leave home without your All-terrain Baby Jogger, Portable Hot Tub, TRIKKE Roadster, Disposable Washcloths and TravelJohn Disposable Urinal. Travel Wheelchairs & Scooters – Just about anyone can go pretty much anywhere with one of these travel mobility scooters or lightweight transport wheelchairs. Don’t let a disability, weakness or injury confine you unnecessarily. Get going! Your independence is waiting for you. Diabetes Travel Aids – If you manage your diabetes with insulin, take a look at this these portable insulin cases for travel. You’ll also want to stock up on sterile insulin syringes (don’t forget the Safe-Clip). And for long distance travel, or even at home, you’d be smart to consider a Portable Leg Massager. Don’t Forget these Travel Goodies! Bon Voyage and safe travels this holiday season to all of our Allegro customers! We appreciate your business. If inclement weather is forcing your workouts indoors, we have just the right workout equipment to keep you in shape over the winter. No need to pay for a gym membership year after year. Instead, invest in your own home gym and in no time you’ll have everything you need to accomplish any fitness goal, plus the ultimate weapon against missing workouts – geographical desirability. Allegro offers fitness equipment and accessories for all ages and abilities. No excuses! Magneciser Pedal Exerciser– There are other pedal exercisers available, but the Magneciser is the ultimate in adjustability, automation and function. Use for both upper and lower body exercises. Jacobs Ladder Total Body Exerciser – As one Allegro customer says, “Jacob’s Ladder is not for people who don’t want to get in tip top shape.” It’s a patented commercial cardio machine specifically designed for fitness enthusiasts, athletes and professionals. Made to order, please allow 6 to 8 weeks delivery. See also the Jacobs Ladder Biggest Loser version. ProStretch – Unilateral– Still one of Allegro’s most popular products, the ProStretch stretching system stretches and conditions the lower leg muscles, tendons and ligaments to help you recover from workouts faster, recover from injuries, improve athletic performance, remove tightness and reduce injuries. See the ProStretch Double – Bilateral Stretching System to stretch both legs at the same time. FitBALL Sport Exercise Balls – FIRM EDITION– This FitBall is the next generation of the #1 burst-resistant exercise ball. Firmer than the original FitBALL, it is designed especially for trainers, therapists, fitness professionals and consumers that like a firm, yet high-quality exercise ball. Don’t forget the FitBALL Air Pump! ProFitter 3D Cross Trainer – Perfect for snowboarders, skiers, surfers and anyone who wants to maximize their active lifestyle, this balance trainer is great for individuals of all ages and abilities. More like a sport than an exercise! Cando Yoga Mat – Thick enough for comfort but thin enough to roll up and take anywhere. 68″ x 24″ x 1/4″. No phthlates, dioxin, furons, phenol or heavy metals. Non-skid. The perfect yoga mat. Cando Low-Powder Latex Exercise Bands – Highly effective and cost effective too. Exercise band therapy is the most commonly prescribed exercise for rehab, conditioning and training. Simply cut your exercise band to an appropriate length and start exercising! Many resistance levels to choose from. Contains latex. Resistance Chair – Freedom Flex Shoulder Stretcher – If you have a Resistance Chair – the Freedom Flex Shoulder Stretcher is the most popular add-on for people with arthritis, frozen shoulder syndrome or other shoulder ailments. If you don’t have a Resistance Chair Exercise System you should get one. Uni-Vest Professional Weighted Vest (Long) – 20 lbs Included – Lose weight faster and tone quickly while wearing extra weight during your workouts, walks or runs. Uni-Vest from Ironwear is the only weight vest line to be endorsed by Reebok. This vest comes with 20 lbs of weight. Additional Flex-Metal add-on weights sold separately. Here’s to healthy, happy workouts!